Exactly what has Jesus done to deserve this treatment? The series depicts Our Lord as a failure who is sent to earth a second time by God the Father to learn from the example of a superhero. This is absolutely horrendous! Jesus is God and God is perfect—He cannot fail in anything! According to the writers, God the Father was disappointed with Jesus for being taken captive and crucified so quickly after being sent to earth. Since then, God the Father has locked up Jesus. As a few thousand years pass, a superhero appears on the scene, Sun-Man, who, blasphemously put by the writers, God exclaims, “that’s what I wanted for you!" As if Russell can interpret the bible better than 2,000 years of scholars and saints in the Catholic Church! He states that in the comic, Jesus is appalled to see what has been done in the name of Christianity in the past 2,000 years. This comic is downright blasphemous and must be stopped. How dare DC Comics depict Our Lord as a failure, and blaspheme God the Father by making Him seem displeased, even ashamed of His Only Begotten Son! 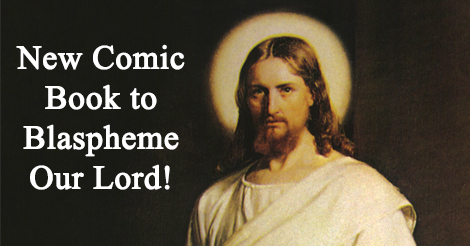 I am deeply offended by your future publication by DC Comics, Inc., “Second Coming”. This comic is blasphemous and offensive to every Christian. It is horrendous and portrays Our Lord Jesus Christ as a failure, with God the Father being ashamed of His Son.